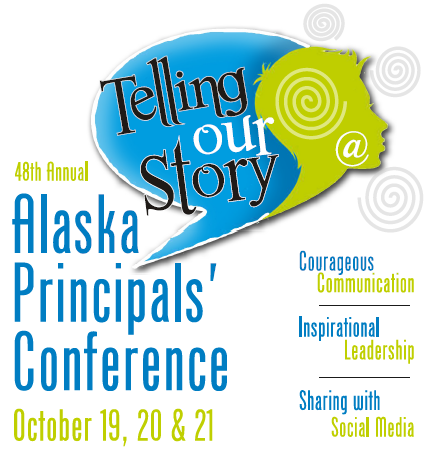 On October 21, 2014 I had the honor and privilege to give the keynote address at the Alaska Principals Conference in Anchorage, Alaska. The theme of the conference was Telling Our Story and my focus was on Who’s Telling Our Story: The Use of Social Media in Education. The conference theme was a brilliant concept because as our educational system changes it becomes vital that educators, specifically principals and district administrators, tell our educational stories. Here is a brief glimpse into some of the main points from my keynote. Who is telling our story? The question is based on media coverage of education. It is extremely rare to see the front page, above the fold, a story about education that is positive. Our current status with respect to news stories published about education is negative and the five major online news organizations (Fox, CNN, NBC, ABC) do not have a link on their main page to educational information. This is neither negative nor conspiracy theorizing. It’s simply a fact related to the world we live in and the issues we face globally. Take a look and see for yourself. Therefore, if the press does not put education on the front page of the newspaper or provide a tab on their main page, why tell our story? If we don’t someone else will. Well that has some validity but I think it could be rephrased to say, if we don’t no one else will. So this is a reason but not the real reason. It’s the only good press we will get. At times it may feel like this and past history of reading stories in the paper would find this to be rather accurate. But this is not the real reason. Great things happen in our schools every day. Think about that phrase. Think about your classroom(s), school, students, staff, and community. Each and every day something great happens in our schools. This is the REAL reason why we tell our educational story. Every day in our schools there are stories of how hard work paying off. How students overcome challenges. Teachers working to make a connection with students who haven’t found their place in school. Schools providing community service in our towns and cities. Academic and athletic success as an individual, groups, and teams. Schools and communities working together. It’s there… every day… in each of our schools and the stories deserve to be told. Not for the glory. Not to be smug. But to recognize effort, success, hard work, and the fact that great things are happening in our schools and most people have no idea it’s happening. One of the challenges in using social media tools for digital storytelling is to decide where to begin. As complex as this may sound, with all the different options, it’s a rather simple answer. Just pick one. Don’t get hung up on a social media app, site or program. Just pick one and begin to put up relevant content for your community and you will begin to connect, share, and collaborate with them. So who is telling our educational story? We are! We are sharing the great things happening every day in your schools by using social media for digital storytelling. Your students, staff and community deserve to hear these educational stories. So give it a try and let us know how it goes.